Crossley Brothers was set up in 1867 by Francis (1839 - 1897) and William (Sir William from 1909) (1844 - 1911) when Francis, with help from his uncle, bought the engineering business of John M Dunlop at Great Marlborough Street in Manchester city centre manufacturing pumps, presses and small steam engines. William joined him shortly after the purchase. The company name was initially changed to Crossley Brothers and Dunlop. Each of the brothers had served engineering apprenticeships, Francis, known as Frank, at Robert Stephenson and William at W G Armstrongs, both in Newcastle upon Tyne. William concentrated on the business side with Frank providing engineering expertise. The brothers were committed Christians and strictly teetotal refusing to supply their products to companies such as breweries that they did not approve of. They adopted the early Christian symbol of the Coptic Cross as the emblem to use on their road vehicles. The business flourished and in 1881 Crossley Brothers became a private limited company and in 1882 moved to larger premises in Pottery Lane, Openshaw, in east Manchester. In 1869 they had the foresight to acquire the UK and world (except German) rights to the patents of Otto and Langden of Cologne for the new gas fuelled atmospheric internal combustion engine and in 1876 these rights were extended to the famous Otto four stroke cycle engine. The change over to four stroke engines was remarkably rapid with the last atmospheric engines being made in 1877. Further improvements followed including the introduction of poppet valves and hot tube ignition in 1888 and the introduction of the carburettor allowing volatile liquid fuels to be used. It was by adopting the heavier fuelled "Oil" engine that the companies future was assured with the first one being demonstrated in 1891. In 1896 they obtained rights to the Diesel system which used the heat of compression alone to ignite the fuel. The first was built in 1898. By the turn of the century there was also some production of petrol engines and from 1901 these were finding their way into road vehicles including, in 1905, Leyland buses. A major contribution to manufacturing was the introduction of the production line. The Crossley system even influenced Henry Ford who visited Pottery Lane at the turn of the century. Crossley Motors Ltd was first registered on the 11th April 1906 (and re-registered with a different company number in 1910) as the vehicle manufacturing arm of Crossley Brothers originally based in the main factory but in 1907 moving to a nearby site they owned in Napier Street, later changed to Crossley Street, Gorton, Manchester, England. The first car had actually been built in 1904 but clearly the parent company saw a future for these new machines and decided a separate company was required. Despite the move of vehicle production the limits of the Pottery Lane site were again soon reached and in 1914 a further 48 acre site was bought in Heaton Chapel, Stockport which became the Errwood Park Works. Construction of the new factory started in 1915 and although intended to relieve congestion on the old site it was rapidly given over to war work. The western half the site became the Crossley Motors managed National Aircraft Factory No 2 built in 1917. This factory was bought from the government in 1919 and became the Willys Overland Crossley plant and was eventually sold to Fairey Aviation in 1934. In 1938 The eastern side became another aircraft factory, this time managed by Fairey, and after the second world war became the final home of Crossley Motors. Re-armament work caused the search for more space and in 1938 a factory in Reddish just over a mile east of Errwood Park. This factory closed in 1965/6. 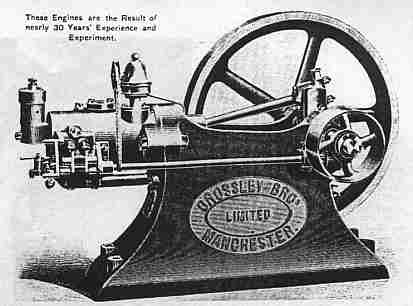 In 1919 Crossley Brothers bought Premier Gas Engines of Sandiacre, Nottingham who built very large engines and in 1935 changed their name to Crossley Premier Engines Ltd. The Nottingham factory was expanded and production continued there until 1966. By the 1960s although sales remained reasonable the company had moved into the red. The design of the engines then being made was essentially 40 years old so in 1962 agreement was reached to use the French Pielstick design. Production of these engines, intended for ships, railway locomotives and electricity generation was initially carried out at Nottingham. But, before the engines could become established the money ran out and the company had to call in the receivers. A purchaser was found in Bellis and Morcom Ltd but the name Crossley-Premier was kept. The market for engines was continuing to shrink and in 1968 the new company joined the Amalgamated Power Engineering (APE) group and the name became APE-Crossley Ltd. For the first time the new company used the Coptic Cross logo on the engines, it had previously only appeared on Crossley Motors products - the rights to use it had to be bought from British Leyland. APE in its turn became part of Northern Engineering Industries (NEI) and the company name became the unwieldy NEI-Allen Limited - Crossley Engines. NEI themselves were in 1988 taken over by Rolls-Royce plc and the company became part of the Allen Power Engineering - Crossley Engines division of the Rolls-Royce Industrial Power Group. This in turn became Crossley Engines division of Rolls-Royce Power Engineering continuing to produce the Crossley-Pielstick range until 1995. The factory, renamed as Crossley Works, remained open assembling some engines made from parts made elsewhere in the company but they no longer carried the Crossley name. On 27 February 2009 Crossley Works on Pottery Lane closed, leaving a few staff in the offices to move what remained of the business to the Rolls-Royce plant in Dunfermline, Scotland. Manchester City Council purchased the site in mid 2009 and demolition of the works commenced on the 3 December with the last Crossley employee leaving the site on 4 December 2009. Over the years more than 100,000 Crossley oil and gas engines have been built and it is a testament to their quality that many of these are still in use to this day.